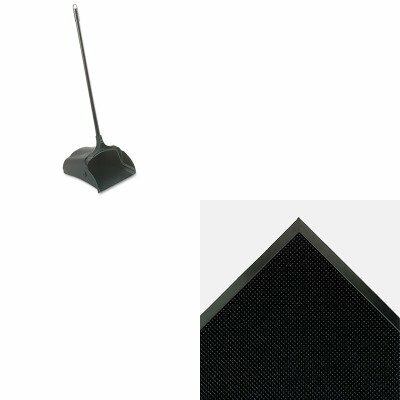 strongRCP253100BK/strongBR/Rubbermaid-Black Lobby Pro Upright Dust Pan, Open StyleBR/Wheeled, vinyl-coated dust pan with superior durability and ergonomic safety features. Yoke and handle assembly with larger, stronger and quieter hinge pins. Durable wheels and wear pads on back of pan extend product life. Built-in handle on back of pan lets you empty without touching pan bottom. Ideal for use in malls, restaurants and lobbies. Will not stain, discolor or absorb odors. Materials: Polypropylene with Vinyl Coated Steel Handle Width: 12 1/2quot;.BR/BR/strongCWNMAFG62BK/strongBR/Crown Mat-A-Dor Entrance/Antifatigue MatBR/Want some tips for keeping your home and office free from dirt and debris Here are 2,400 of them. Thats how many shoe-cleaning rubber fingertips there are per square foot on these mats. The flexible surface also provides the comfort and qualities of an anti-fatigue mat. Beveled edges keep mat flat and reduce tripping hazard. Easy-to-clean design saves you time and energy. Mat Type: Anti-Fatigue Mat Application: IndoorOutdoor Materials: Rubber.